We started the Inventables Marketplace to make sourcing and selling materials and technologies easier than the status quo. Most of the connections we make help incrementally improve a product. Using our marketplace, engineers find new materials and create new features, builds a fresh take on an old features, or lower the cost of manufacturing for his or her product. At Inventables we also hope to keep the "anything's possible" spirit alive and inspire a whole new generation of product developers to have the courage to take a swing and change the world in a big way on the innovative blue sky projects. From time to time we create product concepts to demonstrate how product developers can use our online marketplace. 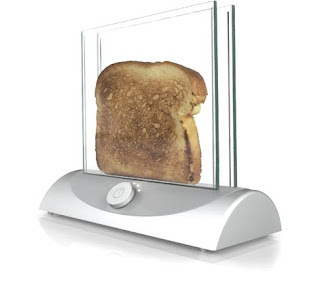 This transparent toaster allows you to see the bread while it is toasting so you're never surprised by toast that comes out too dark. This idea is based on a transparent heating glass technology. Although the glass does not currently get hot enough to toast bread, the vendor explained with some R&D this application may be possible.